How did I do in August? 1. Blackstar Warrior (581) – thank you Lando! 3. Deviant Friday Five – Aug 13 (191) – apparently Dejah Thoris can drive internet traffic – who knew? This is the last day of the August sales contest at Lulu, so if you’ve been pondering a purchase of NOD, I would be grateful if today was the day. You can get 10% off the price with the coupon code “FOUND”. It looks like NOD #4 will publish this week. I have a few bits of editing and design to finish up – so probably Thursday. Wish I could have had it out a week ago, but real life does intrude! Contents: Medieval Bestiary, Gods of the Golden Sea, Eastern Venatia sandbox, Ruins of Timulus adventure, Pleasure Palace of Izrigul adventure and another two chapters of Phantastes. Will probably come in around 110 pages. I’ll keep the price as low as possible. Later today I’ll post the last preview of Ibis and a few more thoughts on Mystery Men! Thanks for reading folks – you’re all making a dream come true for me here. 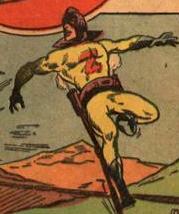 Introducing the Golden Gladiators, a fictional super team of public domain comic characters from the golden age. Uses the system described HERE, giving all heroes 15,000 XP to spend. 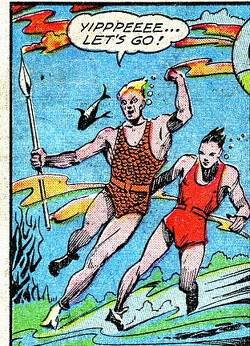 Barry is the defender of the underwater kingdom of Merma from the “Midget Kingdom”. District attorney who had acid thrown in his face by a criminal, blinding and scarring him. 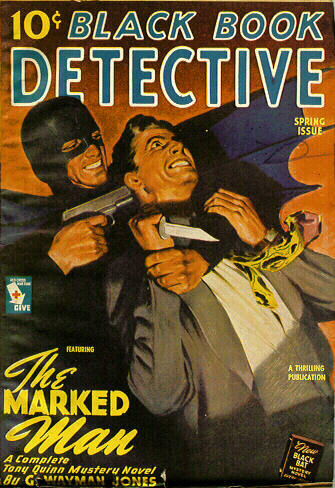 After an eye transplant, he gains the ability to see in the dark and takes up a life of crime fighting. 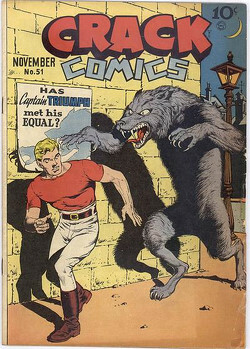 Brusilof, a Yugoslavian scientist, gains his weird powers in a lab accident prompted by a Nazi attack. He is covered in black fur and has a wolf-like face. When Lance Gallant’s twin brother Michael is killed in an act of sabotage, the Greek fates decide to intervene. 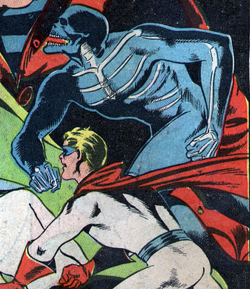 Now, when Lance touches his “T”-shaped birthmark, he merges with Michael’s ghost and becomes Captain Triumph. Jupiter is the master magician of the planet Jupiter. 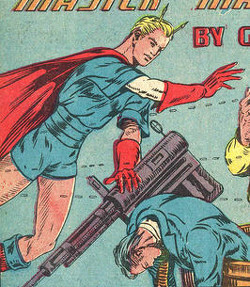 A foundry worker, Pat Dempsey gets his super powers in a factory accident. Demi-goddess and daughter of King Koliak. Bob White is a pro wrestler who fights crime without special powers or gadgets. He is accompanied by his teenage manager, Terry Wake, known as Sleepy. Shannon was the wife of chemist Harry Kane, who invented a spider-web formula before being killed by criminals. She discovered his notes and developed bracelets to shoot the webbing. Joe Blair fights crime in a costume with wheeled feet. A cheap, open content Super Power game based on the SRD, essentially taking the Mystery Men! post and expanding it to include all the rules needed to play the game. I want it to include the rules of play (lots of powers, simple mechanics, a monster list of viable opponents), sample heroes and villains drawn from the public domain and a sample city setting, a super-sandbox, so to speak, with random encounters and a few set villain lairs. What I need for such a product is some art – is there anyone willing to provide some black & white drawings of a few public domain heroes and villains – maybe six of each? If not, maybe I could do this as a patronage project and commission some art. So – who wants to make a supers game? If I can get some support, I’ll devote the time to write the game and post it as a beta test document that anyone can download and critique and then put it up on Lulu as a download and print book. 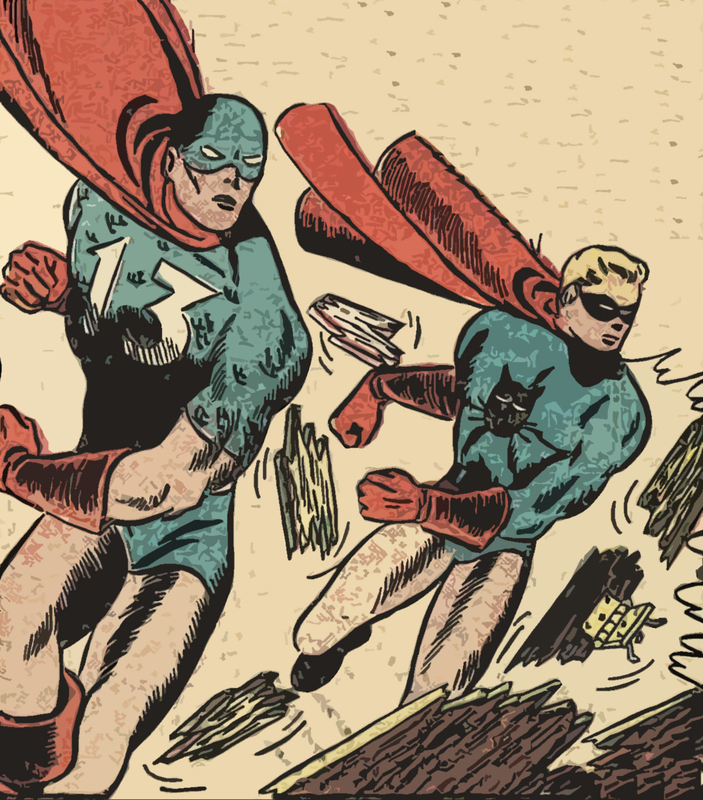 So you’ve spent your hard-earned dollars (or euros or pounds or yen, etc) on your favorite fantasy system and now your gaming group has developed a desire for some two-fisted, capes and cowls, super powered gaming. Option one is to spend some more cash on a new set of rules. Option two – we’ll call it the re-use/recycle option – is to turn your fantasy game into a super-powers game. 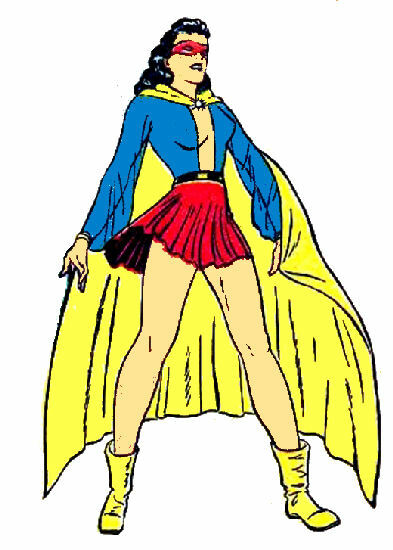 Thanks to the concept of magic spells, most of what you need to duplicate super-powered crusaders is already present in your fantasy rules. All you really need are a few guidelines and house rules to make it work. The following article aims to fill that bill. The traditional 3 to 18 range of six ability scores works fine for a super-powered game, provided you adjust a few definitions. Where a score of 9 to 11 is usually represents average for human beings, super-beings need more room to shine. For a super-game, assume that most normal human beings have a score of 1 to 6. 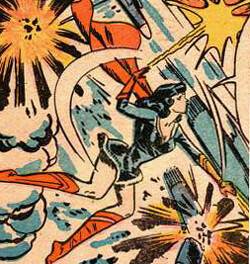 Scores of 7 or more represent super-human abilities. Ability score bonuses kick in at a score of 4, and improve every three points thereafter. You get a pool of 14 dice to roll your hero’s ability scores. For each ability score, you choose how many dice you roll and remove them from the pool, with the stipulation that you have to roll at least one dice for each ability score. The set of rules you choose to convert into a super-powers game will dictate what kinds of bonuses are attached to each ability score. Since henchmen are usually only used by villains, a Referee might convert henchmen into contacts that are willing to aid a hero – the chief of police, for example, or a reporter. Heroic feats of daring-do are part and parcel of a super-powered game, and are most easily handled by allowing basic ability score checks – i.e. roll 1d20 and aim to roll lower than the most relevant ability score, with penalties applied by the Referee based on the difficulty of the task. A character trying to leap to the top of a five story building, for example, would roll against strength. To keep things simple, all heroes in the game are treated as fighters and use the fighter’s Hit Dice, combat matrix / attack bonuses and saving throw charts / saving throw number / saving throw bonuses. If you want to get fancy and run some magic-users, go for it. Heroes (and villains) are built using experience points. At the beginning of the game, the Referee (or Narrator) decides how many experience points are available to the players to spend on super-powers. Anything not spent on powers goes toward determining the character’s level. For example, a Referee decides that players in his current game begin with 20,000 XP for character creation. One player spends 15,000 XP on powers, leaving him with 5,000 XP to determine his level. Another player might spend only 5,000 XP on powers, leaving him with 15,000 XP to determine his level. 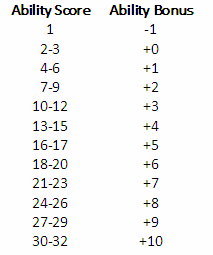 As experience points are earned, they can be spent to add new powers, upgrade existing powers (see below) or simply applied to the hero’s experience point total, which determined level. All of the super-powers in the game are represented by spells. The number of spells, and their level and effects differ from one system to another, so different systems will produce different kinds of heroes. 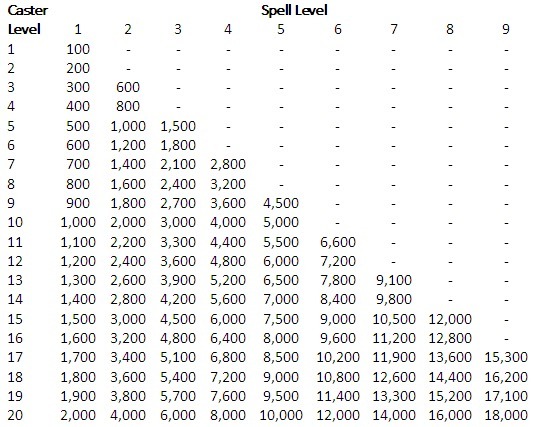 Spell level refers to the level of the spell, be it a 1st level spell, 4th level spell or 9th level spell. 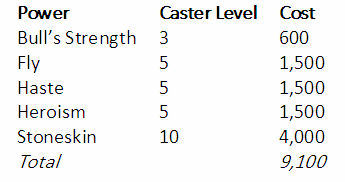 Caster level refers to the effective level of the person casting the spell, since many spells base their variables on the level of the spell caster. Magic Missile, for example, usually determines the number of missiles one can cast on the level of the spell caster. Fireball determines how many damage dice you roll based on the level of the spell caster. The following table charts out the costs of super-powers. A spell’s duration translates into the duration of the power for a single fight scene. Outside of a fight, powers are usable at will, and thus have no functional limit to their duration. Spells like Haste are assumed to only work on the hero with the power, rather than being something the hero can “cast” on others. If a player wants such a power to work on others, the experience point cost is doubled. It is up to a player to describe how his powers operate (i.e. are they magical powers, functions of high-tech battle armor, aspects of alien physiology). Because low level characters gain levels more quickly than high level characters, it would be possible, using these rules as written, for a new character to load up on super-powers, come in at a low level, and then quickly catch up to players who opted to take more levels and fewer powers. For this reason, a -10% penalty is applied to earned experience points for every 3,000 XP spent on super-powers at character creation. We’ll pretend that Minerva is a new character being created for a game, and that her player’s referee has decided that players may spend 15,000 XP on character creation. Bull’s Strength allows her to boost her strength by +4 for 3 minutes. Stoneskin will allow her to absorb 100 points of damage before the power stops working. Minerva’s player now has 5,900 experience points left to figure out her character’s level. For most old school games, this would translate into a 3rd level fighter. Thus, Minerva will have the attack bonuses, Hit Dice and saving throws of a 3rd level fighter, along with the power to fly, move at high speed, bonuses to strength, fighting ability and resistant to most damage. All in all, a pretty powerful woman. 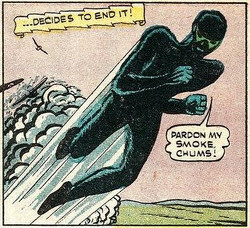 Every character, hero or villain, should have a specific weakness or flaw that will be their doom if discovered. This is kept secret, even from the Referee, but should be something that can be discovered. Wide latitude is allowed here, and players and the Referee must be able to trust one another to come up with a valid weakness. For simplicity’s sake, translate gold pieces into dollars and don’t worry about the realism of the prices involved. Mystery men don’t spend much time in comic books shopping. The following game stats can be used for modern pieces of equipment. Pistol: One attack per round, 1d10 damage. Rifle: One attack per round, 2d6 damage. Machine Gun: Two attacks per round at 1d10 damage or one attack per round at 2d6 damage. Laser Weapons: As the firearms above, but +1d6 damage. Vehicles: Treat vehicles as monsters under the control of their driver. | Motorcycle: HD 3 (15 hp); AC 5 ; Atk 1 ram (2d6); Move 150. | Car: HD 5 (25 hp); AC 4 ; Atk 1 ram (3d6); Move 120. | Tank: HD 10 (15 hp); AC 1 ; Atk 1 cannon (6d6); Move 100. | Locomotive: HD 15 (15 hp); AC 3 ; Atk 1 ram (6d6); Move 400. | Fighter Jet: HD 20 (100 hp); AC 3 ; Atk 1 cannon (4d6) or 1 missile (8d6); Move 3500. 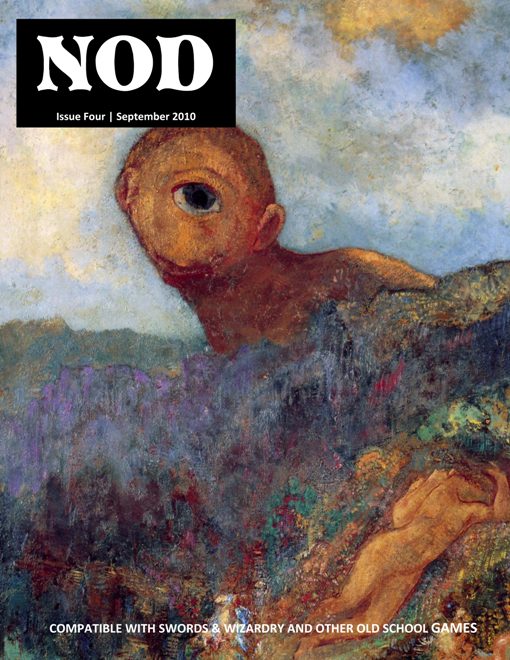 The penultimate preview of Ibis – one more to go and then I get into Mystery Men, The Gods of the Motherlands and Western Venatia, a land of blue-blooded knights, black-hearted robbers and silver-tongued merchants. 37. Three Cockles: This restaurant, owned by an émigré from Nomo named Malvina (3 hp), is under a bright blue sign decorated with three large cockle shells. The restaurant caters to expatriates from Nomo and the other city-states of Umbriago. They are an unruly and dangerous bunch, but the restaurant is usually full of laughter and singing with only the occasional duel. Duels in Malvina’s are done in a painted ring. Combatants are tied left wrist to right wrist, and engage in pummeling and wrestling until one person submits or is unconscious. Wagers fly all about the room during these bouts, and both winner and loser are treated to a steaming plate of food and a mug of wheat bock. When one enters the Three Cockles, their eyes are immediately drawn to a number of large, steaming cauldrons in the center of the room. These cauldrons contain all the fruits of the sea – cockles, salty sea slugs, clams, oysters, fish (in a stew with saffron, scallions and dark wine), crayfish, squid and octopus tentacles, etc. A pot of garum is on every table. The owner of the establishment, Malvina, is a youthful woman with a hard face and eyes that look right into a person’s soul. She has tawny blond hair, usually pulled back in a bun, dark brown eyes and is quite tall for an Umbriagan woman. Malvina is a divorcee, having once been married to a minor magus of Ibis; she now carries a chip on her shoulder toward all magicians, students and intellectuals. Besides her waiters and cooks, Malvina also “employs” a band of pikeys (gypsy halflings) who skulk about the room picking pockets and doing odd jobs. The halflings live in the cellar in squalid conditions, and have been forced to serve Malvina because she holds their grandmother, a fortune teller, captive in her chambers above the restaurant. They are always under Malvina’s watchful eye, and she also has a bull mastiff on guard in her room. The halflings are beaten savagely by Malvina if they are caught plying their trade, but always wind up back in the restaurant when things cool off a bit. 39. Goldsmithy: Svalgault (gnome, 1 hp) runs a very successful shop of jewelers and goldsmiths, all of whom are gnomes. The ground floor of Svalgault’s is a workshop of tiny tables and shelves and a locked, freestanding vault containing anywhere from 20 to 80 pounds of gold and silver, and maybe 1 to 10 pounds of platinum. The floor above has been extensively altered from its former state. It has been bricked in to create a system of artificial burrows for the gnomes and their little families. The top floor contains Svalgault’s palatial residence, a seraglio of clockwork doxies, expensive rugs from Ishkabibel and beaded curtains from Ophir. The gnome jewelers specialize in astrolabes and amulets. Like svalgault, they have light brown skin, salt-and-pepper hair and blue eyes. Svalgault is possessed of an impetuous curiosity and loves to play a good prank (though he never mixes pranks with business). 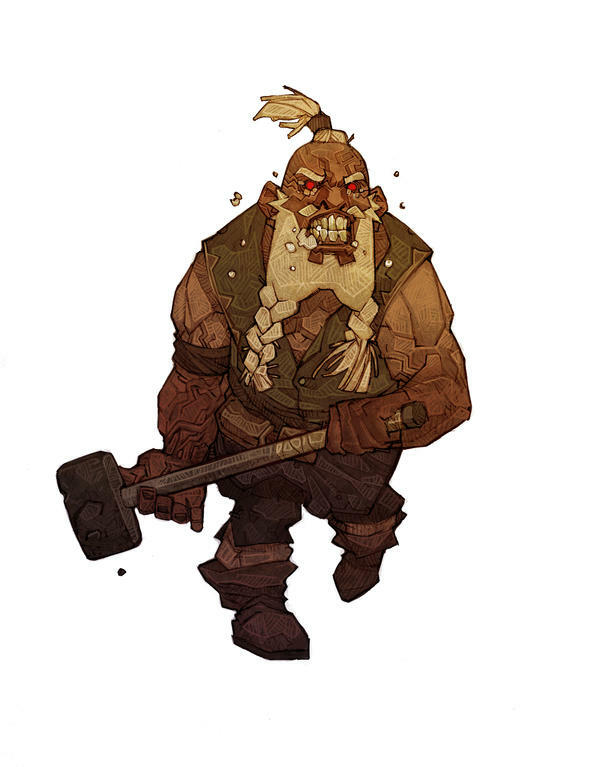 When challenged or contradicted, he flies into a terrible rage, and can fight as a berserker. He is a frequent guest at Malvina’s , and she knows well that he and his people must not be targeted by her little band of captive thieves. 41. Exotic Redsmith: Xihuitl (4 hp) is a tall, thin woman with cinnamon skin, dark brown hair, brown eyes. She is immaculate in her appearance, wearing a white tunic, leather sandals, copper jewelry (including a nose stud) and she has three black lines tattooed on her chin, running from her lips to her neck. She is an immigrant from far-away Hybresail, brought to Ibis (via Ianus and Ophir) by her husband, a roughneck sailor from Tremayne who spends most of his time at sea. 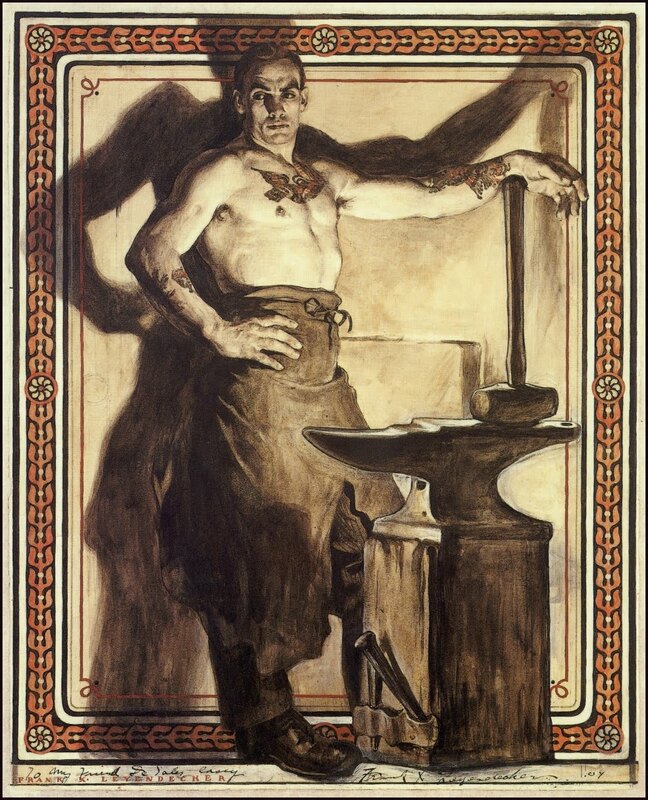 Xihuitl is a kindly but jealous woman who makes a living as a redsmith (i.e. she works in copper and bronze), specializing with vats and cauldrons (she made the cauldrons in Malvina’s Three Cockles restaurant ). Xihuitl has a young son, Coyotl, who is always by her side and learning her craft. He is possessed of a wondrous intellect and frightening psychic powers (treat as a level 5 psychic). Coyotl has wicked eyes, and his piercing stares have been known to unnerve even the most stouthearted barbarian. Xihuitl’s shop is cluttered with keepsakes from her husband’s travels and with wooden idols from her native land. A seemingly harmless iron trunk in one corner is large enough to hold a person, and the interior is lined with long spikes. Xihuitl uses it for sacrifices, a handy spout siphoning the blood into a ritual bowl of jade (worth 35 gp). She makes these sacrifices infrequently, and maybe tellingly, she usually chooses sailors who remind her of her errant husband. 43. Masoleum of the Golden Princess: This building is a tall, narrow pyramid of limestone clad in white marble and topped with beaten brass (the original gold was stolen many times). Entrance is via the ghoul tunnels under the city or through a secret entrance on the southern wall that leads to a short tunnel and a sudden fall (10-ft). The pyramid is home to a mummified princess called Hashminepsis and nicknamed the Golden Princess from her habit of bedecking herself in a ridiculous amount of gold jewelry. Her wickedness carried her into the afterlife as an avaricious, undead monster, now attended by scorpions, the ghouls of Ibis and ladies-in-waiting (wights), as well as an ill-tempered and sarcastic idol of the scorpion goddess Selchis. Treasures: 1,300 gp, two sunstones worth 1,200 gp each, a jade mask worth 95 gp, a necklace of gold discs worth 9,000 gp, a brass ankle chain worth 100 gp and a jaw of dust of appearance sealed with wax. | Hashminepsis: HD 6+4 (37 hp); AC 3 ; Atk 1 fist (1d12); Move 6; Save 11; CL/XP 7/600; Special: Rot, hit only by magical weapons. | Lady-in-Waiting: HD 3; AC 5 ; Atk 1 claw (1 hp + level drain); Move 9; Save 14; CL/XP 5/240; Special: Drain 1 level with hit, hit only by magical or silver weapons. | Ghoul: HD 2; AC 6 ; Atk 2 claws (1d3), 1 bite (1d4); Move 9; Save 16; CL/XP 3/60; Special: Immunities, paralyzing touch. 45. The Lamb and Scallion: This low building is actually constructed about half above ground and half below. One enters by descending wooden stairs, and wide ledges around the exterior of the room hold low tables and woven mats for seats. The room is always stalked by the owner, Hasani (2 hp), the owner, a large, red-faced man with a bushy black beard and sunken eyes. He always wears rich clothes and a large, white turban and carries a ciphering stick (for recording one’s bill) and a large knife that he enjoys flashing in people’s faces. Naturally, Hasani is a coward at heart, and quickly backs down when challenged. He employs several cooks who prepare rich dishes of antelope steaks, legs of mutton and goat stew, spiced with pepper, saffron and other exotic products of the far south. Pantries connected to the main room contain barrels of sweet ale, spiced wine, bottles of rum and brandy and wheels of cheese. Hasani has five wives, all of whom work as waitresses in the restaurant and make a game of stoking their husband’s jealous disposition. He has but a single son belonging to his third wife and adopted as his own. Adom is a layabout and a wastrel who is always working a scheme to get rich. He is a fair swordsman, but shys away from adventuring. | Adom, Fighting-Man Lvl 2: HP 13; AC 9 ; Save 15. Short sword, dagger. Thanks to Tony Dowler at Year of the Dungeon for his dungeon maps, the format of which inspired my little mausoleum. I’m highlighting Arnold Tsang today – arnistotle on DeviantArt. He has a rugged style with great lines and hatchwork. 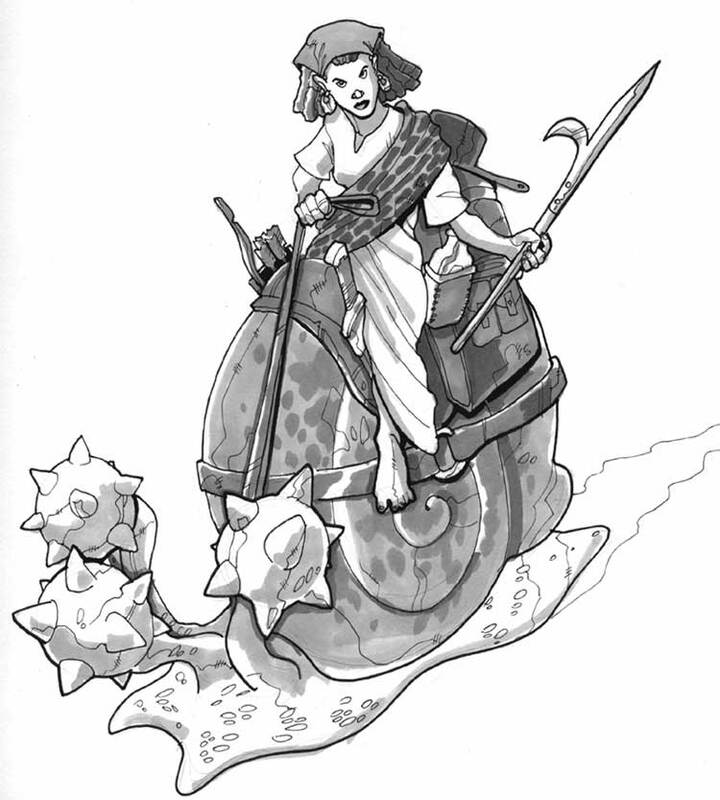 I don’t know who she is or where she is, but I know in my heart that somewhere in NOD, this adventurer is cruising into a sleepy village (probably with a cult of purple worm worshiping ghouls living beneath a field of mauve turnips) on her trusty steed, on her way to seek fame and fortune. Artist is Pachycrocuta, who some may remember illustrated my PARS FORTUNA races. This piece is exactly why I commissioned him – fun, interesting and with wonderful bits of detail. Check out this guys entire portfolio and then explain to me why he hasn’t illustrated a monster book yet! Trust me – if I had the money, he would have. Yesterday, I notched over 10,000 page views for the LAND O’ NOD. In celebration, I’m putting up a Calendar of NOD for download. Some explanation: I love sitting down to read settings with totally imaginary gods, new calendars, etc. On the other hand, I don’t love running those settings, at least not for people who haven’t read all the same material I have, because they don’t know what I’m talking about when I mention Pelor or the month of Harvesthold or whatever – at least, not in the same way as if I mention Apollo or October. 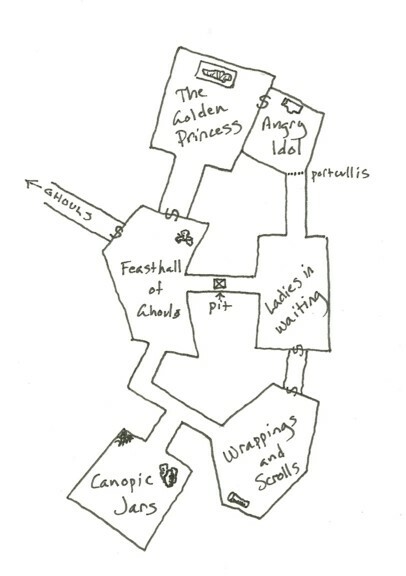 The purely imaginary is fun, but sometimes takes players out of the game, especially if they’re like my players and would rather spend their time playing and exploring dank caves and moldering ruins instead of brushing up on an encyclopedia of imaginary stuff. 1 – Keep it simple – I have enough to do running a game, I don’t need to tax brain remembering a complicated calendar. 2 – Make it immediately accessible to the players, with just a tinge of fantasy to keep it “exotic”. 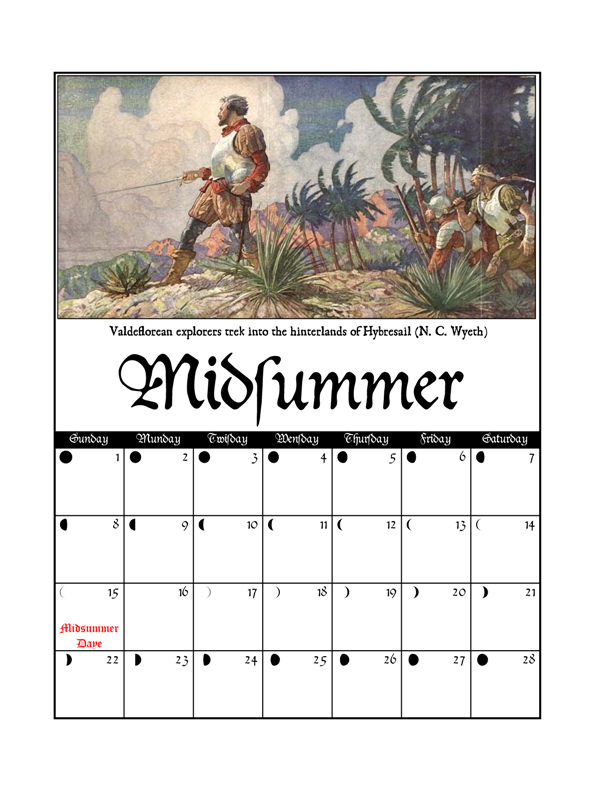 To keep things simple, I decided that each month would have four weeks of seven days each, and I threw in a 13th month (Midsummer, technically) to keep the year about as long as a real year. I used slightly archaic names for the other months to make them recognizable. I then decided to inject some fantasy into the fact that there are 13 months, which, we all know, has to be unlucky. So, Januar becomes the cursed month, a month of twilight when the dead Sun is tromping through the Underworld awaiting rebirth. During this month, all over the globe, the skies are always overcast and the sun is but a dim, gibbous light. During these months, all the evil things that dwell in the dark corners of NOD emerge from their caves and walk the land. The unconsecrated dead rise from their graves and caper and cavort. Goblins sharpen their blades and make war on humanity. Dragons emerge from their slumber and remind people of their true place in the hierarchy of things. Januar is the month when adventurers are loath to leave the security of stinking, disease-ridden city-states, for they know something much worse is waiting outside. Anyhow – you can download the calendar as a PDF below. The holidays on the calendar refer back to the Gods of the Motherlands (not yet published, but very soon), a mash-up of Greco-Roman religion with the Medieval Christian Church. Six more locations for Ibis (use the keywords below for the other posts – they’re becoming too numerous to link). 25. Coffee House: The broad, single-story building sits between the University and the Souk, and attracts a higher class of person than the Spotted Sphinx. The interior walls of the coffee house are lined with velvet couches, with a number of small, circular tables placed so that patrons have ready access to their drinks and the delicate, exotic viands served by the host. A back room serves as a kitchen and pantry, and it is here, in locked iron chests, that the precious coffee beans (worth 100 gp/lb) are kept and later ground. In the center of the main room there is a gilt, marble table holding several charcoal braziers. Bronze flagons of water are set on grates over these braziers to be heated, with the host and a number of serving boys in silk tunics pouring the water through the ground beans into silver carafes, which are then served to the customers, along with porcelain cups. 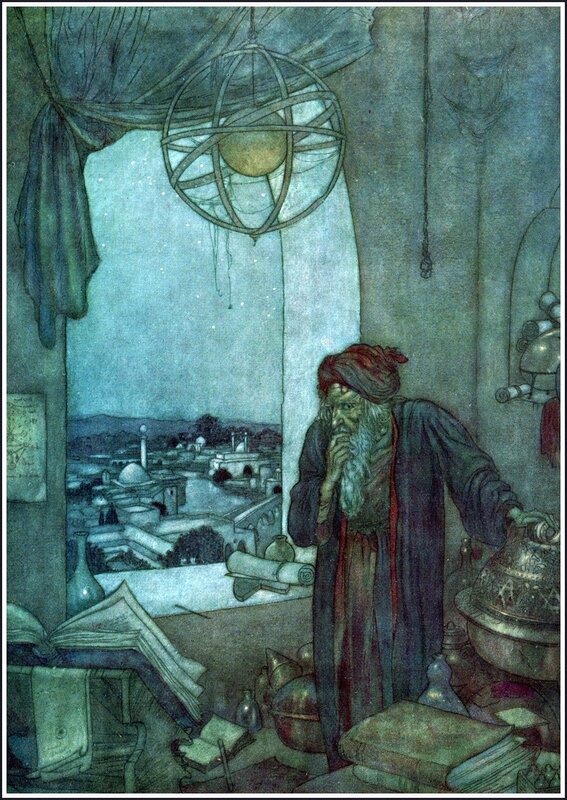 The host is named Baruuf, and he is a spindly, supplicating old gentleman of 40 winters, usually wearing an embroidered robe of damask and brocade and a neat turban pinned with a silver brooch. Baruuf works for Panth, a retired warrior and trader who established a well armed caravan to traverse the eastern Nabu to the highlands beyond, where the finest coffee is grown. Panth, nicknamed thus for his dusky skin and fighting prowess, is in the coffee house most days, conversing with clients and making deals. Although no longer the juggernaut of his youth, he is still tall and broad shouldered. He wears expensive silk robes and adorns himself with multiple pieces of gold jewelry (600 gp worth, at minimum), and always keeps his falchion (treat as battle axe) under his robes. He keeps his pet fox on a chain nearby. A carafe of coffee costs 10 gp, and one can order light fare of an exotic nature to go with their coffee – a typical bill runs 50 gp. | Pantha, Fighting-Man Lvl 6: HP 31; AC 8 ; Save 11. 27. Temple of Isis: This four-story structure has a commanding view of the Souk and the Road of Kings. The building is constructed of marble-clad limestone, and is topped with a brazen dome and a spire in the shape of an angel. One enters the building through a door of white wood hammered with golden nails. Inside the door is the main hall of the goddess. The main hall is 35-ft from marble floor to ceiling and contains a chryselephantine idol of Isis and numerous columns covered in the strange pictoglyphs of ancient Nabu. The northern wall of the main hall contains an entrance to the inner temple and three balconies overlooking the hall. These balconies are each a series of arches and can be accessed by a locked door. Beyond the main hall are a number of vestibules and concealed staircases that lead into four floors of living quarters for priestesses, storage rooms, meditation areas, a hospital floor and offices. Amazon guards are posted inside the entry door and at the top of each staircase, and males are not permitted into these areas unless they are accompanied by a priestess, for the temple is overseen by a sisterhood of devout nuns. Beyond the living quarters lies the inner sanctum of the temple, with a smaller idol of Isis enthroned and holding the infant Harpocrates. This statue is carved from marble and clad in gold leaf (worth 5,000 gp). Beneath the inner sanctum, accessible via secret trapdoor, are two levels of catacombs and tombs in which are interred former nuns and priestesses, as well as a former princess of the old royal house in a secret vault. Another secret vault in the catacombs holds the temple’s treasure: 2,100 cp, 730 ep, 1,100 gp, a brass coronet worth 175 gp and a chalcedony worth 1,250 gp. The high priestess of the temple is Manesha, an older woman with olive skin, silver hair and soft, hazel eyes. Manesha is very short and thin, and wears silk gowns of the ancient style underneath more conservative blue robes of office. She is usually adorned in a wide necklace of gold and sapphires (500 gp) and ivory bangles on both arms (100 gp total). Twenty nuns dwell in the temple and tend to sick and infirm women and children. Some wander the streets collecting alms for the poor and sick. | Manesha, Adept Lvl 7: HP 24; AC 9 ; Save 9; Special: Spells (2nd), healer. | Priestess (5), Adept Lvl 1: HP 1d6; AC 9 ; Save 15; Special: Spells (1st), healer. | Sister (15): HP 1d4; AC 9 ; Atk 1 weapon (1d4); Move 12; Save 18; CL/XP A/5; Special: None. 29. Lecture Hall: The main lecture hall of the University is a three-story structure, with each level ringed by an arched portico. Within the portico are dozens of plain rooms containing a dias for a speaker and benches or chairs for students. The uppermost level contains rooms for the ten scholars on the faculty and a large room, library and laboratory for the headmaster, the archimage Randac (a notorious libertine in his youth made honorable by age and infirmity). The faculty and their specialties are as follows: Anioth (law), Haluim (arithmetic), Minia (geometry), Falanes (medicine), Shakir (astronomy), Amsi (music theory), Thema (grammar), Nekhbet (logic), Zalika (theology) and Astarte (rhetoric). Most of the scholars are level 3 adepts (sages), but Nekhbet is an elementalist (and a playful rival of Randac). | Randac, Magic-User Lvl 11: HP 32; AC 9 ; Save 5; Special: Spells (6th). Sable robes of office, a golden amulet bearing the all-seeing eye (symbol of the university), a slim wand of cherrywood tipped in gold and a silver dagger. | Nekhbet, Elementalist Lvl 5: HP 10; AC 9 ; Save 11; Special: Command elementals (see NOD #3 or treat her as a magic-user with many elemental spells). Black robes, a silver amulet bearing the all-seeing eye, the tools of an elementalist (usually carries an athame and goblet). 31. The Bearded Beauty: The Bearded Beauty is a social club of magic-users, illusionists and elementalists. The exterior walls (mud brick) are painted with the picto-glyphs of ancient Nabu, with the most prominent image being a beautiful queen wearing a false beard. The club is two-stories tall, with the upper story containing the infamous “chamber of doors” and living quarters for the club’s landlord, Butros, and his staff. The ground floor contains a spacious common room, numerous small tables, four large tables and five semi-private booths obscured by thick, velvet curtains. The room is kept fairly dark and is lit by tallow candles. The walls and ceiling are decorated with stars and crescents of sparkling, polished tin. Butros is a young man, a former student of Randac  with a young, pretty wife named Tabia who has recently been replaced by a succubus. Butros has bronze skin, sandy brown hair. He is a nervous chap, but very courteous and does his best to keep his clientelle happy. Besides three serving wenches, Butros employs a man named Karmaz-Kan. Karmaz wears a simple leather harness and loincloth and has deep, crimson skin and a mane of shining black hair. He came through one of the doors in the “chamber of doors” and found work here as a bouncer after he adjusted to the heavier gravity. The aforementioned chamber of doors is located on the second floor in the center of the building. It can be accessed by a single door of golden wood that moves around a bit. Inside the room there are a dozen doors, incuding two flanking the entry door but not apparent from outside the room. Each of these doors leads to another place or dimension based upon the position of the stars. The ceiling of the room is glass, and there is a broze astrolabe in the center of the room to make last minute observations possible. | Karmaz-Kan, Fighting-Man Lvl 4: HP 24; AC 8 ; Save 13; Leather harness, long sword, dagger. 33. Akiiki the Bricklayer: Akiiki is a mature man, short and wiry with skin baked into a deep, leathery brown. Akiiki has a fear of beautiful women and married a plain woman named Jendayi (an excellent weaver) and has four children. He shares his 4-story home with boarders and his aging parents. Akiiki is an excellent bricklayer and owns two brick-making operations located just outside Ibis. Despite his success and his family, whom he loves dearly, he remains a bitter man who dreamed of grand adventures in his youth. 35. The Academy: The academy is a fighting school run by Bovis, a young-looking man with alabaster skin, pale blond hair and blue-green eyes. Bovis is a swords-man of considerable skill, and considers himself an artist. As such, he is rather bohemian – unkempt, broody and chaotic. He is a frequent visitor to the coffee house . The academy is a two-story building with a training hall on the bottom floor and living quarters above. 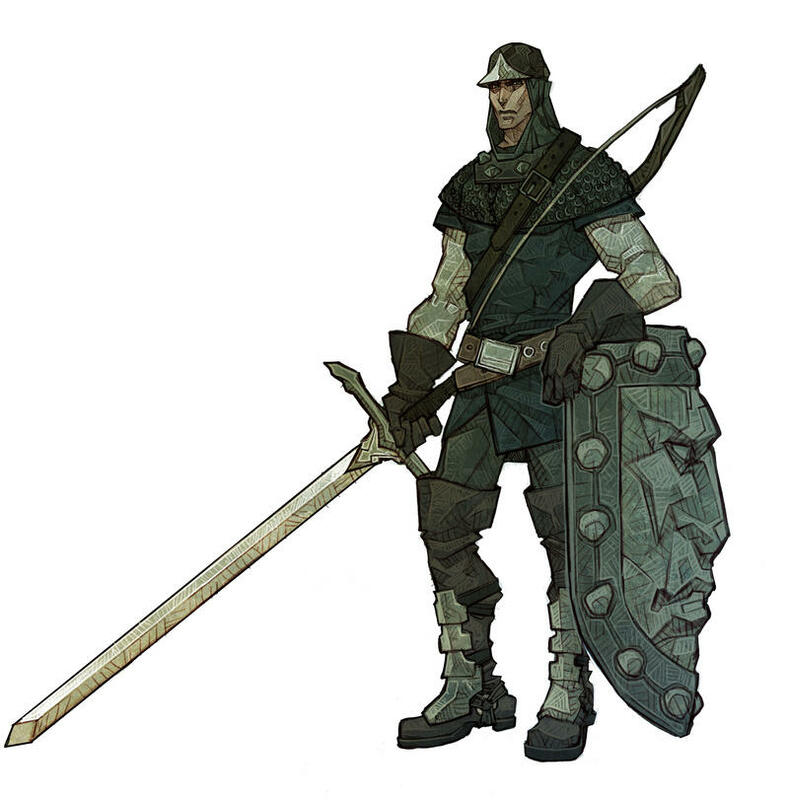 | Bovis, Fighting-Man Lvl 4: HP 29; AC 7 ; Save 13; Leather jack, long sword, dagger. I’m currently working on the monsters for my Pars Fortuna project. Here’s a quick preview of the monsters (by challenge rating) I’ve statted up. 1 – Hraeth: Giant ravens. 1 – Hrogo: Leaping lampreys. 1 – Moggie: Giant cats. 2 – Giant Snail: Main meat animal of Fortuna’s Wheel. 3 – Arakhun: Raccoons the size of black bears. 3 – Dol: Pack dogs the size of mules. 3 – Haloot: Large, quadrupedal, wingless owls. 3 – Maimun: Giant monkeys. 3 – Olph: Carnivorous, predatory sheep. 3 – Topi: Cross between and octopus and spider; live on land and in the sea. 3 – Woin: Bat-winged wolverines. 3 – Xerg: Foxes the size of leopards. 4 – Armadillox: Giant armadillos used like oxen by the natives of Fortuna’s Wheel. 4 – Gangarou: Giant, carnivorous kangaroos that hunt the savanna. 4 – Hhai: Winged cougars. 4 – Jumart: Like a cross between a horse and bull. 4 – Peca: Like feline baboons. 5 – Onkeyn: Swift, horse-sized rhinos with long legs. 6 – Bebb: Giant herbivorous bears with massive heads and long beards. 6 – Orpo: Giant swine who live in rivers and lakes. 6 – Urleel: Cross between a moray eel and sea turtle. 7 – Giant Gulper Eel: Google them. 8 – Giant Mantis: Stalk the jungles. 8 – Mursa: Cross between a walrus and polar bear. 9 – Opur: Penguins the size of killer whales. 9 – Rho: Giant lynx with a large horn jutting from its forehead. 11 – Tragelph: Giant, elephantine goats, kept for their wool but hard to control. 12 – Criniger: Sleek, fur-bearing whales with massive tusks. 12 – Lhee: Beetles the size of elephants, and used by the natives of Fortuna’s Wheel in much the same way. 12 – Snee: Giant terrestrial eels that constrict and send out electrical shocks. 17 – Singawale: Stingrays the size of whales. 20 – Aiwhah: Catfish the size of whales. B – Mercurial: Rats composed of mercury with poisonous bites. 2 – Moonmaid: Tiny figurines carved from moonstone, powers reminiscent of Circe. 2 – Revenant: Animated corpses. 3 – Retriever: Clockwork dogs. 3 – Skeloid, Lesser: Skeletons bound in silver wire with wooden raven head. Absorbs spells. 4 – Ningyo: Guardian puppets with gaze attacks. 5 – Abominid: Spider creatures stitched together from amputated limbs. 5-10 – Imposter: Statues sent to kill their living doubles. 6 – Deruu: Tree women. 6 – Iconogryph: Alabaster vultures created as temple guardians. 6 – Skeloid, Greater: Skeletons bound in gold wire with wooden hawk head. Absorbs spells. 7 – Gongthrottle: Bronze gorillas animated by wrath. 8 – Fulminator: Lightning men. 14 – Sanctus: Images of saints carved in green stone. A – Nizzertit: Slimy, stunted goblins. 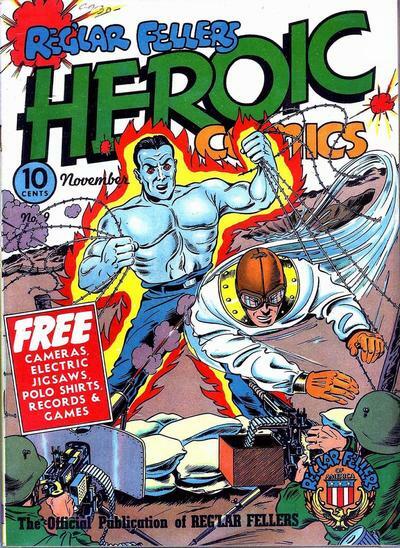 1 – Cakrol: Pangolin warriors. 1 – Ilel: Cloned warriors. 1 – Nif: Wasp women. 1 – Nine: Quick, furry humanoids who live in swamps. 1 – Oraenca: Stout warriors with iron bones. 1 – Skathra: Antelope centaurs. 1 – Tachi: Ape warrior. 1 – Vindlu: Scaled lion. 2 – Caledjula: Flying tricksters. 2 – Jae: Mounds of tricky kelp. 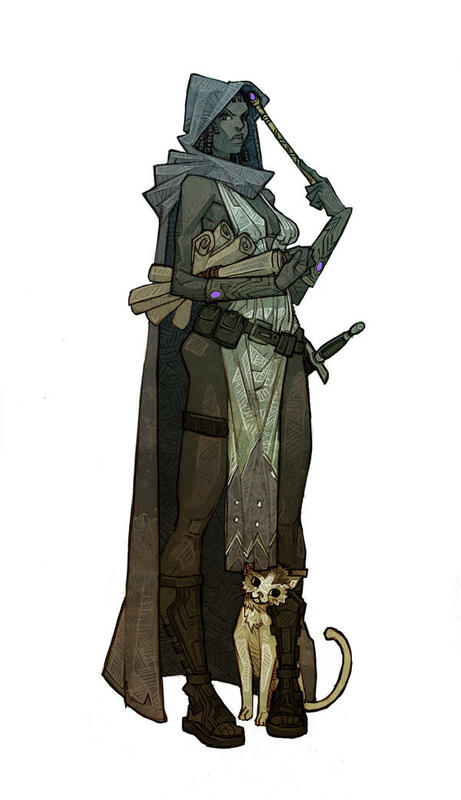 2 – Kyssai: Ethereal scouts. 2 – Olvugai: Tentacled warriors. 3 – Bo’al: Tall, burly humanoids. 3 – Hamazak: Amazon warriors. 3 – Qward: Stocky feline nomads. 3 – Zimbad: Reptilian flyers. B – Tomb Robber: Grey men who burrow into graveyards. 1 – Osk: Golden skinned smiths with pointy teeth. 1 – Ouph, Black: Subterranean fairies who consume hallucinatory mushrooms. 2 – Meagle: Stunted pixies who summon demons. 2 – Zwunker: Swarthy dwarfs with golden hair, negate magic by their presence. 4 – Ouph, White: Pious sculptors. 6 – Ingala: Amazonian nymphs of the rain forest. 8 – Ouph, Blue: Berserk zealots. B – Jeyah: Like furry, giant geckos who produce psychic static. B – Sand Rat: Scaled rats the color of sand. 1 – Dreak: Voracious giant polliwogs. 1 – Vazin: Sinuous lizards who give off electric shocks. 2 – Byn: Siren lizards. 4 – Frosseleth: Woodland carnosaurs. 4 – Palasm: Victims of a disease that become faceless baboons that blend with shadows. 5 – Meerskin: Giant weasels with emerald eyes; surrounded by a miasmic yellow cloud. 5 – Nanc: Copper-furred capybaras with scorpion tails. 5 – Tharp: Swarms of steel-gray wasps; their stings cause hemorrhaging. 6 – Isaelen: Titanic beasts who simply shift from the ethereal plane to capture creatures in its stomach. 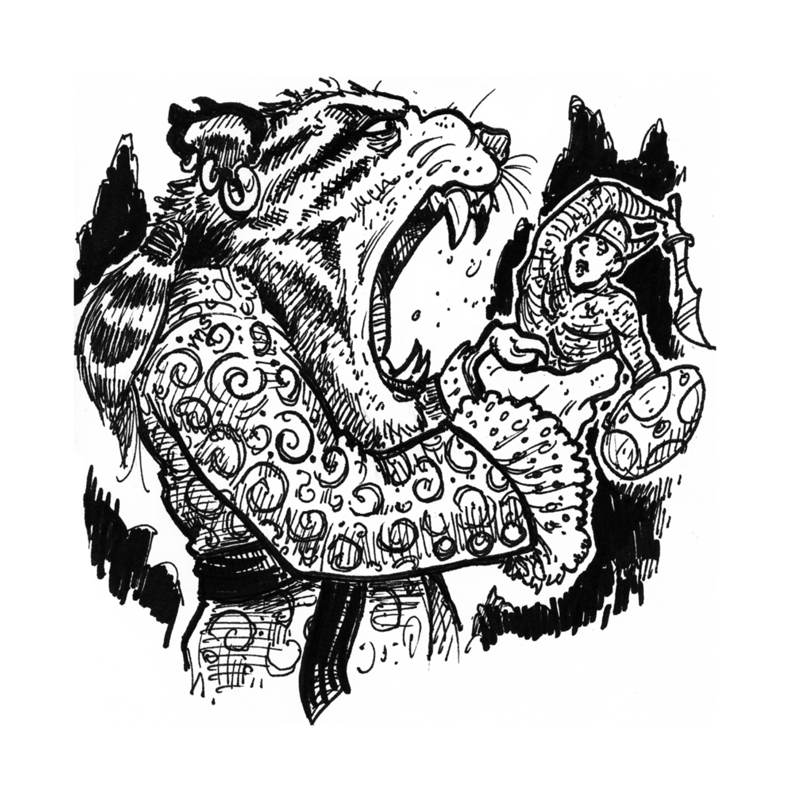 6 – Rhuup: Portly, furred humanoid tigers; swallow people whole. 7 – Aeloll: Arachnid horrors with legs that end in noose-like loops. 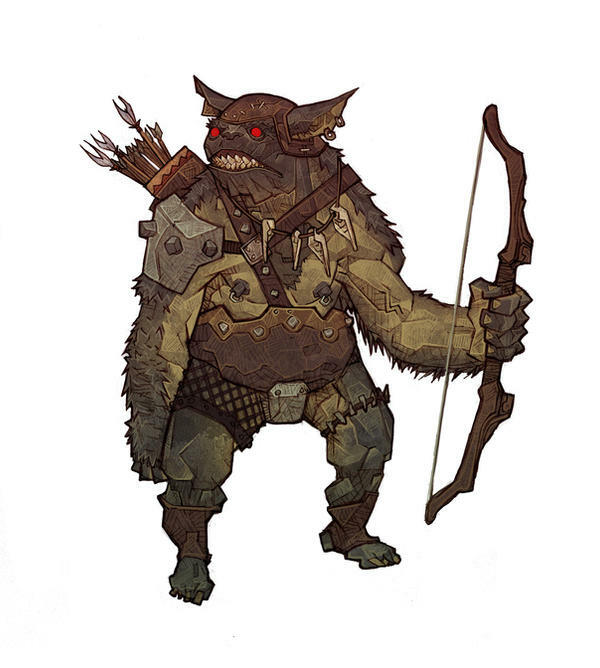 7 – Kruk: Four-armed ogres who trade in flesh. 8 – Idekel: Cross between an alligator and boa constrictor; uses illusions to look like dead wood. X – Demonic Beast: Template for altering beasts. X – Elemental: Templates for altering beasts. X – Tabib: People possessed by feral spirits. 7 – Volp: Crystalline wolves who spread rage, cause misfortune. 8 – Nokt: Green, five-headed crows who spread misery and desperation. 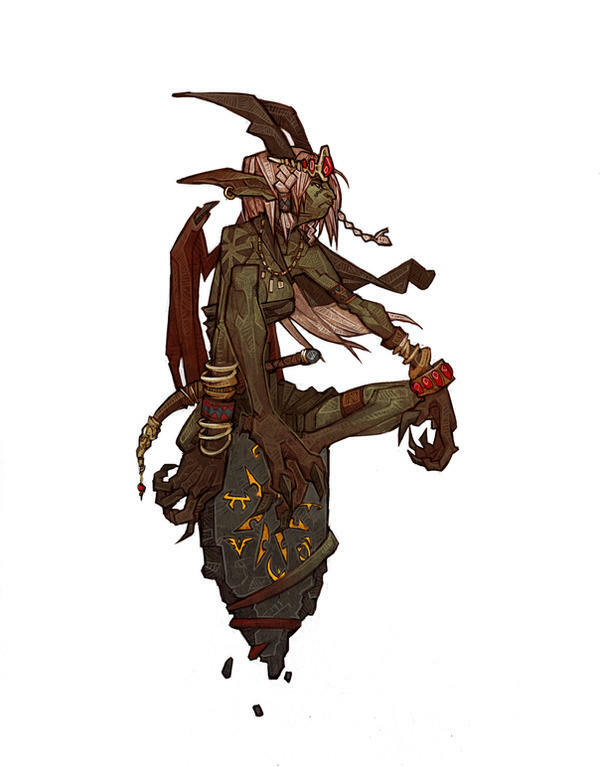 6 – Fiend: Lesser demons with variable abilities. 9 – Haunt: Ghostly creatures with a touch of death. 9 – Nature Spirit: Humanoid spirits composed of natural materials. 10 – Greater Fiend: More powerful demons with more abilities. 10 – Lunarch: Amorphous, silvery bears with spider eyes; serve the Moon Goddess, cause madness. 15-18 – Archfiend: Most powerful demons.